A fun and easy craft to do with kids! Lately, unicorns have been all the rage, from unicorn-inspired makeup trends to the Starbucks unicorn frappuccino. But you don’t have to say goodbye to this colorful trend just yet. You can bring some rainbows and glitter to your holiday season by making one of these DIY unicorn ornaments for your Christmas tree. The holiday season is supposed to be filled with a whimsical, magical spirit, and these colorful ornaments from the geniuses behind the blog Hello, Wonderful will add a special touch to your seasonal decor. Plus, it’s the perfect craft to do with your kids. Glitter ornaments are super simple to make, and they add a nice sparkle to your Christmas tree. 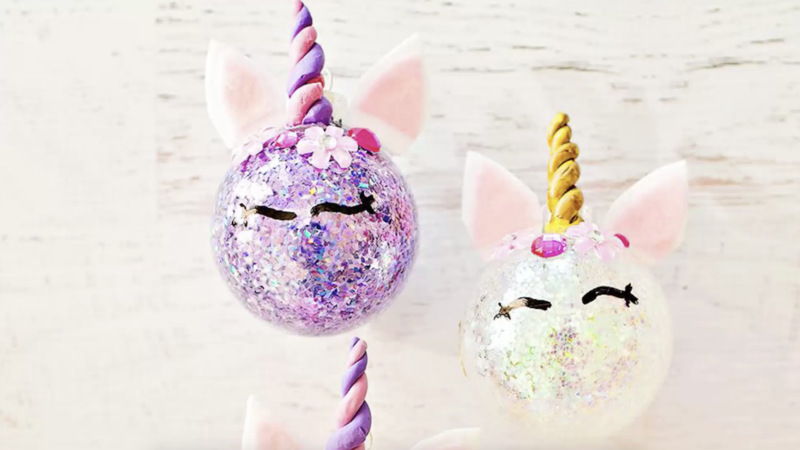 How cute are these unicorn-style ball ornaments? For this project, you’ll need clear ball ornaments, floor cleaner, different color glitter, craft clay for the unicorn horn and stickers for the face of the unicorn. Also grab some felt, markers and a glue gun for decorating your ornament. Of course, it’s also useful to have some parchment paper and funnels to keep the glitter from making a giant mess. Thank you for all the 💗on our DIY Glitter 🦄 Ornaments! See video last post to see how easy it is to glitter your own ornaments and turn them into 🦄. . Although I don’t talk about my other social media here, wanted to share I hit a big milestone on FB and reached 200K fans today! Love if you follow me over there: www.facebook.com/hellowonderful. . . I share multiple times a day – cool ideas, crafts and playful products for kids. So if you want to submit something to share just stop by my page and message the link there. If it’s a good fit for my audience I’ll share it! . . Lots and lots of love, thanks and appreciation for all your support here 💗 #hellowonderfulDIY . . PS. @sendaunicorn_now is now back in stock if you want to send a real 🦄 in the mail! To make these ornaments, you’ll want to start crafting them the day before you want to hang them up, as the clay for the horn has to dry overnight. To begin, simply remove the ornament hook, add some floor cleaner to the ornament, swishing around to coat the insides. Drain any excess liquid, and pour the glitter inside the ornament, covering the sides. Form the horn using the clay, and let dry overnight. Glue the horn to the top of the ornament, draw on some eyes, and create some ears using felt. Use the stickers to personalize each unicorn. There’s this gorgeous gal by user CraftedByYudi. And these beauties from ATouchOfHoneyDesigns, which will let you buy some on Etsy if you don’t feel like making your own! Hello, Wonderful has some other amazing unicorn craft ideas your family is sure to love! Check out this truly beautiful unicorn cake costume (we’re totally bookmarking this for next Halloween!). It’s not easy dancing around in a Unicorn Cake Costume🦄 🎂 😅 Get the details to make your own on the site (Designed by our talented contributor @_theartdream) for a sweet Halloween costume this year 🦄 What are your kids going as? Tag #hweasycostume so we can see! And how about this unicorn-shaped balloon display for your child’s next birthday party? And look at these gorgeous unicorn cookies that basically look too good to eat. Watch the video below to get the full instructions on how to make these playful ornaments or visit the Hello, Wonderful blog for more detailed information.